The castle gatehouse was one of the most defensive parts of any medieval fortress. It was a strong, fortified building positioned to defend the entrance to a castle. Gatehouses usually contained multiple traps and obstacles to foil any intruder. These traps included vast metal portcullises, and infamous murder holes. The buildings of the gatehouse were also some of the grandest of the entire castle, and contained some of the most magnificent chambers for the most important guests. I wouldn’t fancy your chances if you were attacking this castle, eh?! This is the exterior side of the Harlech gatehouse. The wooden steps are where a drawbridge would once have been. In Medieval times, castles were designed to withstand siege and attack. Every castle had the same weak point, however. No matter how strong the outer walls were, every castle was vulnerable at its main entrance. Evidently, you couldn’t build a castle without a doorway – that would have been madness! In times of peace, people needed to come and go as they pleased. However, if the castle was under attack, the enemies often targeted their attentions to the entrance-way – as it was the easiest route to break into the castle. As a result, fortifications and obstacles were built around the entrance to Medieval castles. Nowadays, this seems like a very obvious thing to do, but it this was actually quite a revolutionary idea in Medieval times – it took a long time for people to figure it out. The first fortifications around the entrance to Dover Castle, England, were only built in 1170 – more than 100 years after the castle was founded. Over time, these fortifications grew increasingly sophisticated. The buildings around the entrance became known as ‘gatehouses’. To enter the castle, you had to pass along a passage through the gatehouse, which was filled with obstacles, tricks and traps. All this was designed to make it difficult for any enemy to enter the castle via the main doorway. Most castle gatehouses contained multiple layers of defences to make it as tricky as possible (and as unappealing as possible!) for an enemy to enter. Sometimes even reaching the gatehouse would have been tricky. Many late-Medieval castles were surrounded by moats – meaning that you’d need to cross a precarious drawbridge to first of all. The interior side of the castle’s gatehouse, as viewed from the castle battlements. As you can see, it dominates an entire side of the castle. Within the gatehouse, vast wooden doors would have obstructed the path of any would-be attacker. Often, in late Medieval castles, there’d be another line of defence in front of these doors. The portcullis – that is, a vast iron grille which would have been lowered from the ceiling – made it trickier for battering-rams to break down the doors. The portcullis – which comes from the French word porte coulissante, or sliding door – was lowered from the ceiling via winches and pulleys. Nowadays, most old castles don’t have working portcullises (that’s because they might damage the old, precious stones): however, you can usually see the tracks down which they’d have descended. Sometimes, however, those within a Medieval castle could play an unpleasant trick on anyone attacking the castle. There was often more than one portcullis guarding the entrance passageway which lead into the castle – usually one portcullis at the start, and one at the end. If an intruder entered the passage, they could lower the end portcullis and then, before they could run and escape, they’d then lower the one at the start. The hapless attacker would be trapped between these two iron grilles – and sometimes would have been killed in a pretty gory way. The passage through the gatehouse into the castle was riddled with other tricks and traps. The most infamous of these were the ‘murder holes’. Murder holes were holes in the ceiling of the passage, and defenders of the castle could drop or pour terrible things down onto those below. See the slight gaps in the ceiling? These were murder holes in Goodrich Castle, England. They had to brick them over to stop people falling down them! Often, they would throw down rocks or pour boiling water, as these things were cheap and easy to get hold of. It’s a bit of a myth that they’d have poured boiling oil (oil was pretty hard to obtain! ), but this would have been fatal to any hapless intruder below. Sometimes people attacking the castle might light fires in the gatehouse to try and burn down the wooden doors. Water could also be poured down these murder holes to put the fires out. Another hazard hidden within the gatehouse passageway were the arrow loops. An exaggerated arrow-loop within Bodiam Castle, England. These were thin slits in the stone wall, and archers defending the castle would have fired at any intruder through these holes. They were carefully positioned so that those firing the arrows had a great vantage point over those attacking the castle. They could often have picked off intruders one by one. Attacking the castle through the gatehouse passageway would have been a pretty unattractive proposition! Indeed, the King’s Gate in Caernarfon Castle, Wales, would have had two drawbridges, five doors and six portcullises to pass through. The mighty King’s Gate of Caernarfon Castle. Is that Edward I, whose statue you can see mid-picture? Credit: Anne-Lise Heinrichs, CC-BY-SA-2.0. Over time, castle gatehouses became increasingly complicated, with many new lines of defence against a would-be attacker. The gatehouse building became correspondingly larger and grander. In some castles – such as Harlech Castle in Wales – the gatehouse had symbolic significance, as it was one of the strongest parts of the entire castle. As a result of these factors, castle gatehouses began to contain some of the grandest rooms and apartments of the entire castle. This grandiose gatehouse of Raglan Castle, Wales, housed some of the grandest accommodation. The lower floors of the gatehouse would often be the residence of the gatehouse keeper, who would keep watch upon those entering and leaving the castle. However, the higher floors of the gatehouse could contain some of the grandest chambers and accommodation of the entire castle, used by some of the grandest visitors to the fortress. In Harlech Castle, the gate house spans three floors, and includes space for a chapel. The top layer contains the grandest apartments of the entire castle, and some historians think that these could have been used for a visit by King Edward. In late Medieval times, Britain became a more peaceful place, and castles weren’t so threatened by attack. 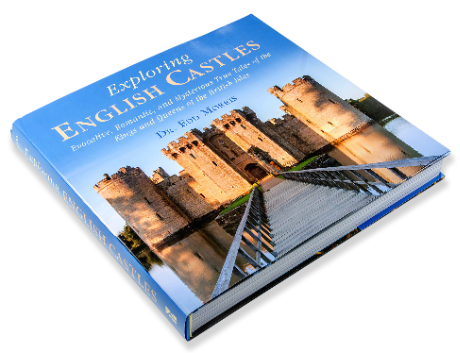 Wealthy lords and barons began to build and modernise castles for show and for prestige. This demonstrated their importance in the local community. As a result, gatehouses became even larger and grander. The intention was to impress someone arriving at the castle – and make the lord look even more important than they’d realised! The gatehouse of Raglan Castle in Wales is a great example of this. This tremendous gatehouse was built to impress guests as they rode up to the castle entrance – defensively, there’s not much there to keep intruders out. The same goes for the gatehouse of Bodiam Castle in England. It was designed to impress visitors and to aggrandise the castle, rather than seriously deter any oncoming attacker. Discover the might of the castle gatehouse, the strongest and most defensive part of any castle. Includes photos and history of mighty gatehouses.